The world outside sounds menacing as loud, thunderous cracks rained down on the home. In the middle of this fierce raging storm with no electricity, siblings Zack and Daniel turn to their father, John Malone. Feeling the boys are now old enough to learn the truth about his childhood, John decides to share a family secret he’s kept locked away, a secret that changed John’s life forever. In a small Pennsylvania town called Lizardville, a young boy named Johnny and his friends set out on a weekend camping trip along the banks of Big Fishing Creek. On the first night, as the boys gather around the campfire, Parker shares a story that happened nearly 80 years ago, the legend of the Ax Factory murders. Soon after, strange, mysterious things begin to happen. Little do the boys realize they have awakened the spirit world! Jimmy, unable to sleep, comes face-to-face with a ghost named Annabelle. She is searching for something and knows the boys are hiding what she seeks. Could the secret lie in an old puzzle box? As this spine-tingling edge-of-your-seat adventure unfolds, one question remains: Will they survive the weekend? I highly recommend this book...it gets better and better with every page. Once you get past the intro of the characters it gets interesting. Great plot! A good story,but not as ghostly as it makes it out to be.I enjoyed it being local to me.Narration by Bryan and Sonja Anderson was good. was given this book by the narrator,author or publisher free for an honest review. I will admit that I was a little disappointed with this book. It is labeled as a ghost story and I started listening with that in mind for Halloween. However, it seemed more like a knockoff version of "Stand By Me" by Stephen King. 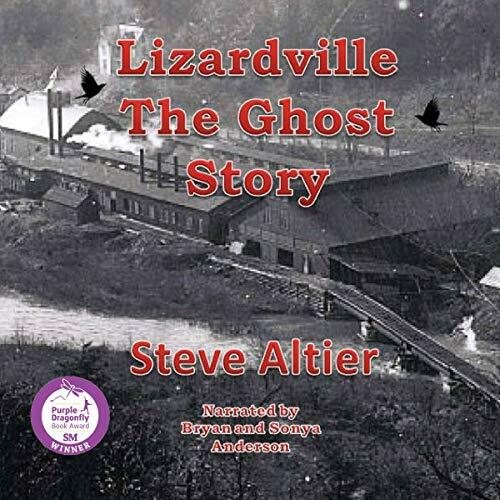 During a power outage, a father starts telling his two boys a story about the town where he grew up, Lizardville. Supposedly, this town was the site of a murder by a prominent business owner, killing his wife's lover with an axe. Then, the wife committed suicide and so the story begins. The first part of the book is mostly descriptions of typical kids, going on a camping trip, rafting down the local creek and talking about the creepy grocery store owner. However, it soon develops into a poignant tale as one of the boys drowns and leaves a mysterious puzzle box for his friend Johnny (the father in the book). Sure, there are some ghosts, a few tense moments and a creepy pair of really big crows that follow the kids on their adventures. The whole book felt more like a tale told around a campfire than a true horror story. I would say that this is entertaining, but not very spooky. Also, I found that the narrator sounded like a robot and I had to speed up the book in order to continue listening. The addition of the female narrator didn't really do much for the book IMHO. Not a bad book, just more for the pre-teen or young adult crowd. I was given a copy of this Audiobook through Audiobook Boom and chose to review it. This was a fun, exciting, fast-moving story. I would rate it PG-13. Younger teens and children could be disturbed by some scarier and violent scenes. A father and his two sons are at home when a storm knocks out the power. When cell phone batteries run out, the father is left with two bored teens, and he launches into a story from his childhood to keep them entertained. The story is part supernatural ghost story, part remembrance of a group of childhood friends. The two combine to create an entertaining, albeit sometimes eerie and gruesome, story of growing up. Is the story real or just something the father made up to occupy his children? It is left to the listener to decide. The narrators did a good job of providing different voices for the different characters. The delivery, tone, and pace suited the events of the story and made for a pleasant, smooth listen. Loved this book. Heart pounding, I listened to it in one sitting. I couldn't put it down!!! I was given this book a review copy but that shouldt sawy you. It was great! Great story! Enjoy it :) Totally entertaining!